Real Madrid president Florentino Perez remains "hopeful" over the health of club legend Alfredo Di Stefano, who had a heart attack on Saturday. Di Stefano, who turned 88 this week, is being kept in an induced coma in the Gregorio Maranon hospital in Madrid. According to the latest medical report, published on Real's website, he "remains clinically stable, but his condition remains serious". "It is a good sign that he remains in a stable condition," Perez said. "Everyone is following his progress with the hope that this stability is a positive thing. "We are all very concerned but we are also hopeful." Di Stefano, who has had several health problems in recent years, fell ill close to Real's Bernabeu stadium. A hospital statement on Saturday said Di Stefano was "under sedation" after suffering "cardiac arrest". The club confirmed he was having artificial ventilation. He has been fitted with a pacemaker since having heart surgery in 2005. Real describe Di Stefano as the best footballer of all time after a glittering 11-year spell at the club. After joining Real in 1953, he helped turn them into one of the world's leading sides. He won five straight European Cups, scoring in each final between 1956 and 1960. He left Real in 1964 at the age of 38 having scored more than 300 goals across 11 seasons. Di Stefano played at international level for three nations but never appeared at the World Cup. He won six caps for Argentina and played four times for Colombia during a spell in that country's league. However, his Colombia caps are not officially recognised by Fifa. Fifa said in 1954 he could not play for Spain but reversed that decision in 1957 after he gained citizenship and he went on to win 31 caps, scoring 23 goals. Real's official website carried a picture of club president Florentino Perez visiting Di Stefano at the hospital on Saturday. Former Real striker Gonzalo Higuain, whose goal sent Argentina into the World Cup semi-finals in Brazil on Saturday, said: "I was told when I got to the dressing room. It is not good news for football, for those who know him, for those who are close to him. "Alfredo was always very close to me, I feel for him, I have great respect for him and I hope that he will recover. I only have words of gratitude towards him." 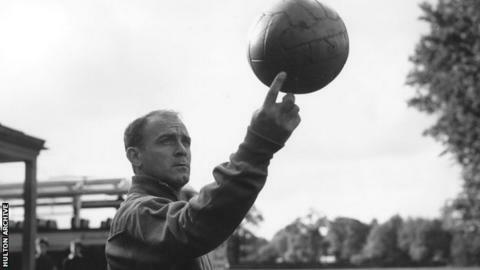 Di Stefano also won four Colombian and two Argentine league titles as a player. As a manager he led Boca Juniors and River Plate to Argentine league titles, and won La Liga and the Copa del Rey with Valencia. He had spells at Sporting Lisbon, Rayo Vallecano and Castellon before taking over at Real in 1982, with the club runners-up in five competitions during his two years in charge. He managed the club again for five months from 1990, winning the Spanish Super Cup against Barcelona. Di Stefano became honorary Real president in 2000.